7:54 p.m. - Just waiting for the Los Angeles Dodgers/Washington Nationals NLDS game to end. The Dodgers lead 4-3 with two outs in the bottom of the eighth. 8:04 p.m. - Seeing Dusty Baker in the Nationals dugout reminds me just how close the Cubs were to winning the National League pennant in 2003. 8:09 p.m. - Susan was in Miami for work the last couple of days (and no, the hurricane was not an issue). She is returning home tonight. 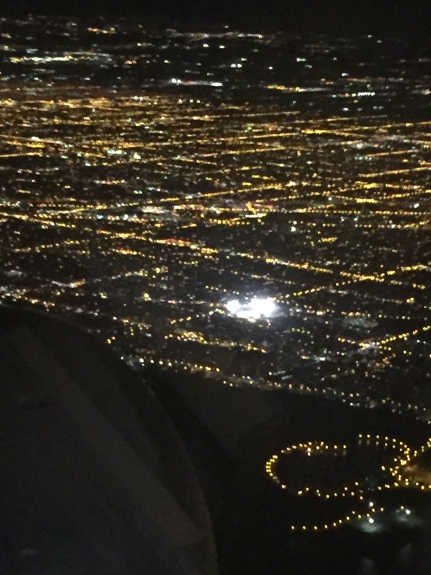 I asked if she flew over Wrigley Field on her way home, could she grab a picture. Guess what? Since the Dodgers/Nationals game is running long, the Cubs will start on MLB Network. Lester avoided trouble when Ross nailed Hernandez attempting to steal second. Despite a leadoff hit, the Cubs avoid trouble. No score. Thanks for all of the texts. Keep them coming. It seems like yesterday when news broke that Dexter Fowler signed with the Baltimore Orioles. Then suddenly, he was back on the Cubs. The best fantasy baseball trade I made this season was acquiring Kris Bryant for Joey Votto and Justin Upton. I've never led a league in home runs since I started playing in 1995. Of course, I still finished in sixth place. I'm sure my cousin's oldest daughter is excited to see Anthony Rizzo batting now. Switching over to FS1. The Dodgers beat the Nationals 4-3 to take a one-game series lead. Hunter Pence leads off and singles. Then, Pagan flies out to left. Did you see the video of Pagan tackling the guy on the field the other day? Will the Giants attempt another steal of second against Lester? Pence advanced to second when Crawford grounded out. Broadcasters reminding the world that Lester can't throw to first. Tomlinson taps it back to Lester, he flips it to first to end the inning. No score in the middle of the second. Giants with two hits. Cubs none. Ben Zobrist leads off. That pitch looked low and away, but called strike two. Cueto fans Zobrist. Addison Russell swings at first pitch and flies out to right field. Two outs and Jason Heyward steps to the plate. Heyward grounds out [3-1]. Conor Gillespie is the third Giants hitter to leadoff an inning. The Cubs have switched gloves a lot this season. Gillaspie nailed at first. Interesting. Cueto grounds out. Two down. Hernandez flies out to left. Another Mobile Strike commercial? I see those all day when I play Two Dots. Javy Baez to lead off. He flies out to centerfield. David Ross up now. Great catch by Hernandez on a deep fly by Ross. I thought he was going to crash into the brick wall. Lester up to the plate. Broadcasters make references to the 1970s Cubs/Phillies slugfests. Lester retired. Cueto perfect through three innings. Still no score. Finally, the retire the leadoff hitter. Of course, Buster Posey singles. Pence up to bat. This summer, my nephew Emil said Posey is his favorite player. Pence flies out to left. Does anyone wear his socks higher than Pence? The fans are booing the two calls, but both pitches were outside. Zobrist misses the fly in left. Runners on the corners with two outs. For the record, autocorrect wants to change Zobrist to sobriety. Grounder to end the inning. Still no score. The Giants have missed every opportunity to score in this game. Did Posey forget how many outs they had when Zobrist missed that fly ball to left? Not sure would have scored, but it might have been worth an attempt. Fowler leads off. He grounds out [6-3]. Hits would be nice right about now. Kris Bryant with a double to left. Cueto is no longer perfect. Rizzo with an opportunity to give the Cubs a lead. Long foul ball to right. Rizzo grounds out [4-3], Bryant advances to third. Two outs and Zobrist comes up. Grounds out [4-3]. Inning over. Tomlinson leads off for the Giants. Lester up to 54 pitches now. Lester strikes out Tomlinson. One down. Gillaspie pops out to Baez at second base. Ross dinged up when Cueto bunts his third strike foul. Inning over. Still scoreless. Cubs are lucky the Giants failed to cash in so far. Cubs missed an opportunity when Bryant reached third. I hate Skip Bayless. Addison Russell leads off. Cueto up to 62 pitches. Russell strikes out. Heyward up. Heyward fouls out to Posey . Baez singles to right. Ross up to bat with two outs. Broadcasters discuss the Lester/Ross relationship dating back to their days with the Boston Red Sox. Full count. Ross strikeouts to end the inning. The Giants "even years" commercial just aired. That reminded me that the 2012 World Series is the only one the missed every single pitch. We were in Spain for our anniversary. Full count on Hernandez. Lester up to 66 pitches. Hernandez lines out to Russell . Brandon Belt up to bat. Belt strikes out. Buster Posey grounds out to Lester. With the ball wedged in his glove, he runs to first and steps on the bag. Still nothing but zeroes on the scoreboard. Lester leads off. One out. Fowler with a long foul ball. Cueto fans Fowler. Two down. Bryant up. Cueto with 85 pitches. Strike two looked low. Now the count is 2-2. Bryant strikes out. Eight strikeouts for Cueto. Pence grounds out [4-3]. Pagan pops out to second. Two quick outs. Brandon Crawford up to bat. Flies out to left and ends the inning. FYI, most people don't sing "Take Me Out to the Ballgame" properly. Harry Caray always sang the wrong lyrics. Rizzo leads off and grounds into the shift. One down. Zobrist is 0-for-2 tonight. Cueto is up to 93 pitches. The count is full to Zobrist, calls time. Cueto strikes out his ninth tonight. Russell up. He's 0-for-2 tonight. Grounds out [5-3]. After seven innings, there's still no score. Tomlinson leads off. One down. Conor Gillaspie up. Aroldis Chapman starts to warm up in the bullpen. Lester up to 84 pitches. Gillaspie strikes out. Two down. Cueto grounds out [4-3] to end the inning. I'm thinking this may go into extra innings. Lester out of the game? Jason Heyward leads off and flies out. One down. Baez up. I still think it's great that he uses Informer as walk-up music. Cueto with 106 pitches. Count is 2-2. Baez with a solo home run. Cubs lead 1-0. Cueto remains in the game to face Coghlan. Cueto records his 10th strikeout. Tommy LaStella pinch-hits for Lester and flies out. Chapman to pitch the ninth. Hernandez leads off the ninth. Giants down to their final three outs. Count is full. Appeal to the first base umpire. Strikeout called. Not reviewable, but it looked like he held up. One out. Nunez pinch-hitting. Count is 1-2. Count is full. Chapman seems wild tonight. Scary when pitches are more than 100 miles per hour. Nunez grounds out [4-3]. Two outs. With two outs, Posey doubles off of the left field wall. Tying run is on second as Hunter Pence comes up to bat. Count is 1-2 on Hunter Pence. Thanks for mentioning Steve Garvey and the 1984 playoffs. Pence grounds out [4-3]. Cubs win 1-0 and take a 1-0 series lead. Marla and I were just commenting on Dusty Baker's time with the Cubs. The boys are going to stay up for the first inning but they need their rest for a great weekend with Auntie Susie and Uncle Bill. Go Cubs!! We'll see them on Saturday. Maybe they'll catch the first inning of Game 2 with us. You brought me back to Humzoo for the first time in years! Can't believe this thing still works. Go Cubbies!